ARCHITECTURE on the Sunshine Coast is all about embracing the environment. The use of ventilation and shade as well as light. The use of natural bushland. Speaking at the Australian Institute of Architects Sunshine Coast Awards last Friday night, artist Blair McNamara reminded the audience how important it was to retain that attitude for generations to come. The artist grew up on the Sunshine Coast with tank water, cold showers that had a cement floor with a chisel slot for the water to drain out between banana trees. The reflection of sunlight from the Skennars buses as they passed. 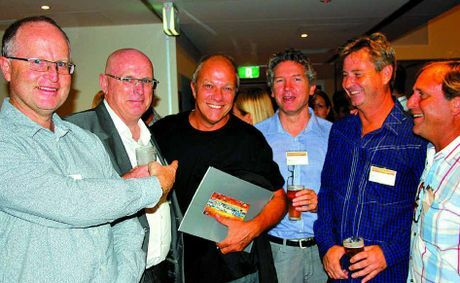 Photo: Mark Damant, left, Queensland president Shane Thompson, of Woods Bagot, Dragi Majstorovic, Liam Proberts, left, of bureau proberts, Paul Curran of Push Architects and Blair McNamara at the 2013 Australian Institute of Architects Sunshine Coast Awards presentation at the Mooloolaba Surf Club. Well already everyone see that buy generic cialis found with ease in the Internet. In special on our website it is full of it. But you forget and constantly you ask.